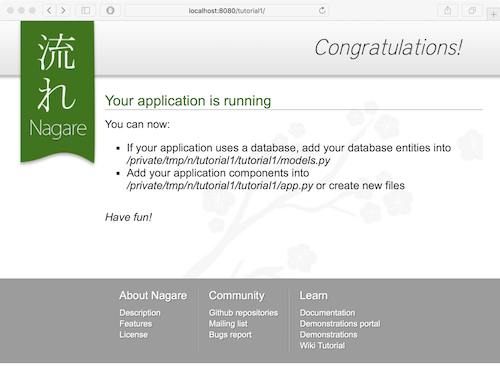 This tutorial will guide you through the basics of Nagare applications. If any error occurs see Nagare installation. 1. Edit the file 'tutorial/setup.py' to set the informations about your new application. Launch your application in reload mode, this way any modification made to your files will automatically restart your application. Open you webbrowser and go to http://127.0.0.1:8080/tutorial, you should see the default application screen.